of our church in a painting by Buffalo-born artist Joseph Mazur. 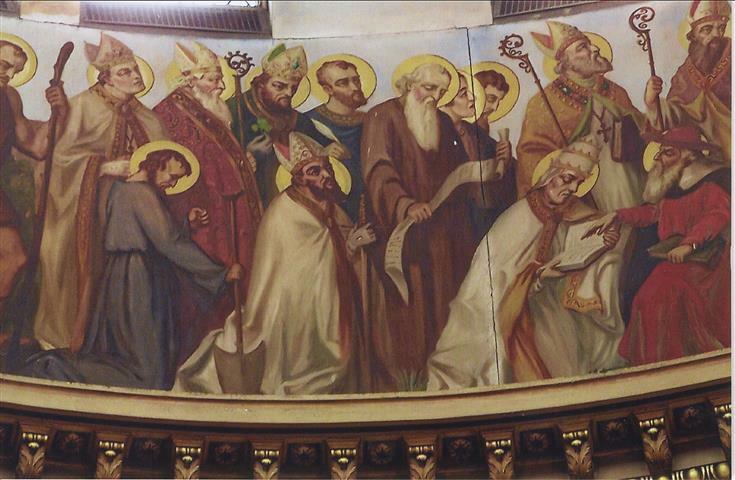 He is depicted as the fourth standing figure from the left in this photo and is part of a group of 14 figures identified as “Confessors, Bishops, and Missionaries.” (Rev. Walter Kern’s “Guidebook to Blessed Trinity R. C. Church,” p. 39). Photo credit: Duane Held. Friday, March 16 ~ Stations of the Cross at 6:00 p.m. In stewardship, you give off the top; not what is left over. you give just the apple core. Lenten Journey Mass ~ This Monday, March 12, Mass will be celebrated at 6:30pm at St. Martin dePorres, 555 Northampton St. Please note that the sites have been changed for the remaining 2 weeks. 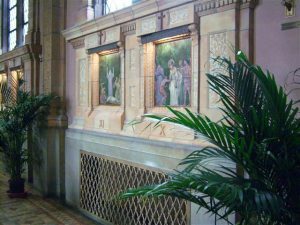 St. Lawrence, 1520 E. Delavan Ave., is hosting on March 19, the Feast of St. Joseph. You are invited to their 5:30pm St. Joseph’s Table, which will replace the social after 6:30 Mass. The Reconciliation Service scheduled for March 26 will take place at Ss. Columba-Brigid, 75 Hickory St. near Clinton. Our 3-part Lenten series concludes Wednesday evening, March 14, at 6pm with “Connections: Reflection on Passover and the Lord’s Supper.” Bob Heicklen will narrate a brief ceremonial Seder meal, explaining its symbolism and similarities to our Eucharistic celebration. Assisted by Dan Korchowsky and his wife, Jacquie, their presentation will incorporate a simple supper featuring symbolic foods which are an integral element of the Passover festival. 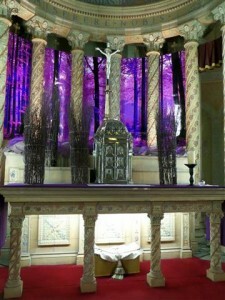 Intentionally Preparing for Holy Week ~ We have made it through a large portion of Lent, and our eyes and hearts are drawing ever nearer to the cross. The choir members glimpse the glory to come every week at practice as we prepare for Holy Week. 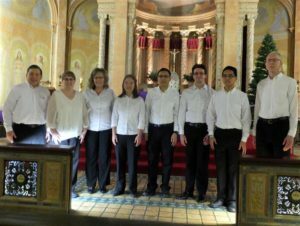 This week’s liturgical musical selections are readying us for what is to come – intentionally propelling us through these final days of Lent. Open my eyes, Lord. Help me to see. Open my ears, Lord. Help me to hear. Open my heart, Lord. Help me to love like You. Open my heart, Lord. Help me to love. I live within You; Deep in Your heart, O Love. I live within You. Rest now in me. Bible Study will resume at 7pm on Monday April 16 (not March 19 as posted earlier) in St. Charles Hall. This will be a two-hour meeting to determine future plans. The first assigned reading is from the booklet, Genesis 12-23 Abraham and Sarah’s Journey, by Kevin and Louise Perrotta (Loyola Press, 2002), pages 4-23. Please contact Althea Porter at 316-8395 to obtain the booklet and participate in this group. Catholic Charities ~ St. Clare of Assisi, our patron saint of the 2018 Appeal, believed that “we are to become the vessels of God’s compassionate love for others.” Today, Catholic Charities shows that same compassion and love for others by offering counseling, and mental health and chemical dependency treatment. Your gift to our 2018 Appeal helps us to continue these services in Western New York. To donate, call 716-218-1400 or visit ccwny.org/donation. Movie Night featuring Risen! Is March 16 at 6:30pm at Franciscan Guest House at St. Lawrence (1520 East Delavan Avenue in Buffalo). The film travels along with the Roman Centurion assigned to find the body of Jesus. This evening is for adults only. Wine and cheese will be served. Stations of the Cross Meatless Soup Suppers at St. Lawrence Church (1520 East Delavan Avenue in Buffalo) will continue on Fridays March 16 and 23 at 4pm. Bring a meatless soup (preferably in a crockpot) to share. In an effort to minimize dish washing, guests are asked to bring along their own place setting and cup. Bread, butter, crackers, and drinks will be provided. Magnificat Ministry to Catholic Women present a morning of prayer, testimony and praise, helping women to experience the power of the Holy Spirit on Saturday, March 17 at the Millennium Hotel, Cheektowaga. 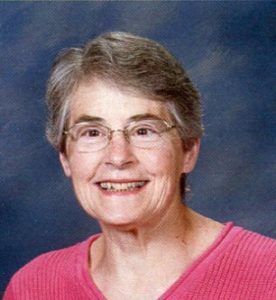 Guest speaker, Marge Fetterman, will share how living a Life in the Spirit has set her heart on fire for Jesus! Registration opens at 9:30am and breakfast program begins at 10am. For tickets or further information, call 716-632-0646 or visit magnificatbuffalo.org. Palm Sunday Buffet Brunch at Our Lady of Fatima Shrine (1023 Swann Road in Lewiston) is Sunday, March 25 from 10am-3pm. Tickets are available in advance by calling 716-754-7489 or at the door. Come join us for a spirit-filled day, with great food, Easter bake sale, raffle and 50/50 split. Proceeds to benefit Our Lady’s Shrine.